Breakfast burritos are a great option for a quick freezer-friendly breakfast meal. They are filling, easy to make, and quite delicious. Plus, they are very inexpensive. 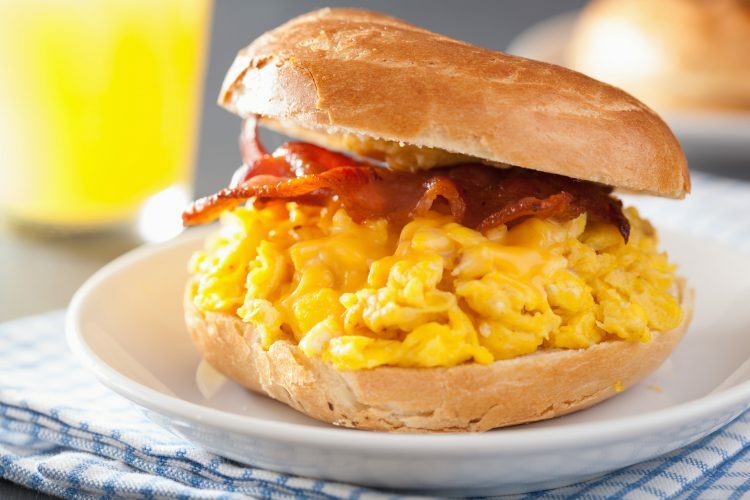 You can include any fillings you like, but the typical base is eggs, cheese, and your favorite breakfast meat. Simply scramble a dozen eggs and meat, whether it is bacon, sausage, or ham. To construct a burrito, take a tortilla and place a spoonful of egg, some breakfast meat, and some shredded cheese in the center. Wrap up the burrito in some aluminum foil and move on to the next one. Once you are finished, place your wrapped burritos into a freezer bag and into the freezer. When you are ready to heat a burrito for a quick breakfast, place one directly from the freezer into the microwave and cook for 30 seconds to one minute on both sides. Feel free to experiment with your burrito filling as well. You can leave out the meat and add in sautéed peppers and mushrooms if you like. You can also use a variety of cheeses. Beans are another delicious addition to breakfast burritos. The possibilities are only limited by what you and your family enjoys eating. Pancakes and waffles are also great breakfast options for the freezer. You can use a store bought mix or make them from scratch, whichever your prefer. Make several dozen of each at one time in order to get the most out of your time. Once they are cooked and cooled, stack them in-between layers of freezer paper in freezer bags. When you are ready to eat them, take the desired amount of pancakes or waffles out of the bag and place them in the toaster oven until they are hot and toasty. You can also add in some of your favorites mix-ins to pancakes and waffles. Berries, chocolate chips, peanut butter, and sweet potato puree are just a few examples of delicious and relatively healthy additions. You can also make freezer friendly breakfast sandwiches for the freezer. You will need your favorite breakfast bread, eggs, cheese, and sliced deli ham. Your bread choice is up to you, but choose sturdy bread like English muffins or biscuits. Crack an egg into each section of a grease muffin tin and bake at 350 degrees for about ten minutes. Once the eggs are done, place one egg on each piece of bread then top it with a slice of ham and your favorite cheese. Sliced cheese is best for these sandwiches as it helps to hold it together. You can then wrap them individually and freeze them. To cook, microwave each sandwich for about one minute until it is warm through. These breakfast ideas are a great way to ensure everyone in your family gets a hot breakfast each morning without a lot of fuss. For more easy meal ideas that you can make with simple ingredients, please visit the iRazoo blog.